The exhibition celebrates the picture books still so loved by children around the world today, The Tiger who Came to Tea, and the Mog series. It also explores the background to When Hitler Stole Pink Rabbit, featuring drawings Judith made as a child refugee fleeing Nazi Germany. You can enjoy a showcase of almost 80 years of original artwork and illustrations by one of Britain’s best loved authors. Curl up and listen to classic children’s stories. Recommended for under 8s. Free with museum admission. Get creative and take home your arts and crafts. Pick up a copy of our trail and explore the exhibition as a family. Recommended for ages 7+. Free with museum admission. 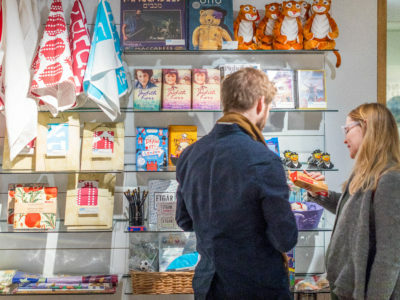 Tiger, Mog and Pink Rabbit: A Judith Kerr Retrospective is a Seven Stories exhibition and is supported by Harper Collins Children’s Books and Northern Rock. The exhibition was developed and first on display at Seven Stories, National Centre for Children’s Books.